Those suffering from addiction feel trapped in the cycle, buried, and unable to come up for air without the pain of withdrawals pulling them down. John Edwards knows this feeling, and wants to express it for those so lucky to be naive to the pain of addiction. John Edwards is burying himself alive. John has been clean for 27 years, originally from Ireland, he battled addiction to drugs and alcohol and has now devoted his life to helping those struggling to recover. According to the CDC, more than half a million people died from drug overdoses to 2000 to 2015, and 91 Americans die every day from an opioid overdose. The White House Council of Economic Advisers put the true cost of the crisis in 2015 at $504 billion on Monday and President Donald Trump said the opioid epidemic was “Ravaging” the country. Recent addiction news outlets report deaths in every in every city in America from major cities to suburbs, and rural areas. The 62 year old will be buried in a 3 foot by 3 foot by 8 foot coffin in the dirt outside the Church “River” in Tampa Bay to bring awareness to opioid addiction in the United States. This is the third time Edwards has been underground for the cause, and this time he was invited back by an old friend Pastor Rodney Brown to stage his experience on the church’s’ grounds. 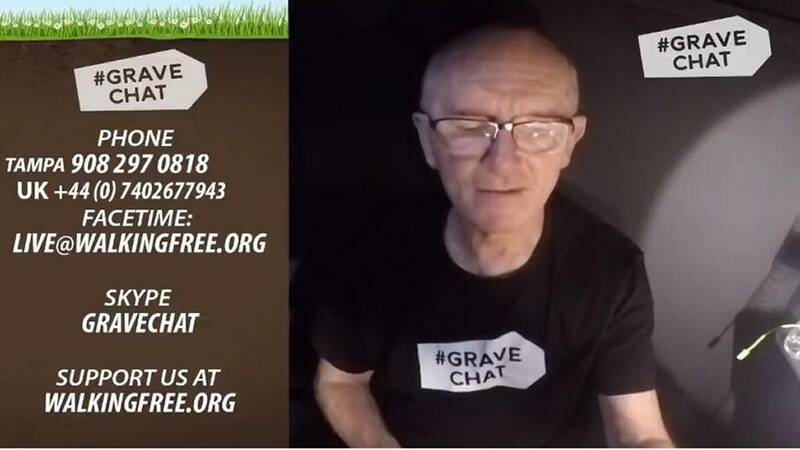 While he’s underground he is open to taking calls, texts, videos, skype messages and emails from those who are suffering from drug addiction, or anyone who is curious about his current situation. Edwards was thoroughly checked out by a doctor before his expected three-day stay, and he prepared by praying and fasting ahead of time. He’s already survived a liver transplant and two bouts of cancer, but he’s feeling a little stiff. While Edwards takes his naps, video testimonies from his past coffin stays play. He says he’s doing well all in all and staying positive. And when his legs cramp up he retreats to a space away from the camera to stretch.